I was fortunate to be invited by Igor to come and visit Crimea, and together with a friend we arrived in July 2005. 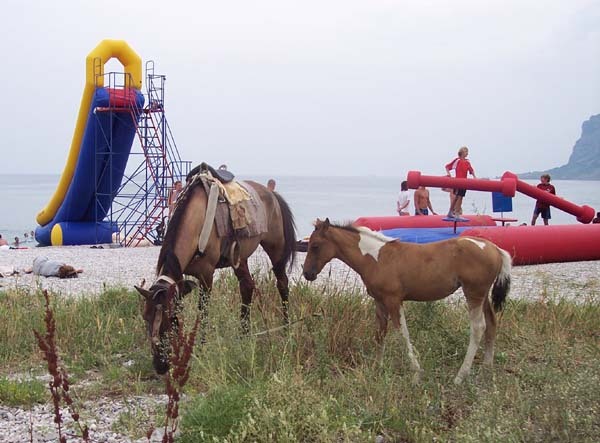 We stayed for 3 weeks and in this time we travelled to a fair number of destinations in the Crimean Peninsular. Since we were travelling with locals, we could get a private visa, which is a much more flexible option, since you do not need to specify where you are staying in advance. In May 2005 the Ukrainian authorities waived the visa requirement for many European countries, although this was stated to be a temporary measure (until October 2005) to help visitors to the Eurovision Song Contest in Kiev. Hopefully this change will eventually become permanent. We started the holiday in a small town called Uglovoe on the western coast, where we stayed in a house as guest of the couple that lived there. The accommodation would be considered relatively Spartan by western standards (outside toilets and showers), but were perfectly adequate, and very good value (just 3 dollars per person per night). The couple that owned the house were very friendly. We used this house as a base to visit many places in the area, including the naval port of Sevastopol, mostly remarkable for its huge number of Soviet era monuments. Mount Sapun was another destination, where various old World War II military equipment could be seen, plus information and displays on the soviet reconquest of the Crimean peninsular towards the end of the war. The plain where the famous Battle of Balaclava took place during the Crimean war can be seen from here, although there is little information given about it. We also visited Balaclava itself, which on first glance seems to be just a quaint little fishing village. However some huge tunnel entrances set in the surrounding mountainside shows what was once a major soviet submarine base (said to be built to withstand a nuclear bomb) The remains of an old castle can be seen at Balaclava, although little is left to be seen apart from a few towers. On another day we visited the area of Bahchisaray, which has many interesting rock caves carved into the steep cliffs, which have been used for various purposes (as living or burial areas) by the local people from Stone age times through to the medieval period. All are free to visit, and have not been enclosed by walls or fences like many ancient monuments throughout Europe. We also looked at the pretty town of Bakhchisarai, which was the Tatar capital at the time they ruled the Crimea. The hills surrounding this area were steep and stony, and we were driven to the top of one allowing us to ride down on our mountain bikes, which was quite an exhilarating experience. We next moved to a small resort town close to Alushta on the Southern coast. After the rather hectic pace of our first few days we were a lot more relaxed here. During our stay here we visited many of the seaside resorts along the coast, such as Sudak, Gurzuf and the upmarket Yalta. At Sudak we saw the remains of an old Genoan fortress, the most impressive one in the Crimea. Our third base was at Kazantip, in the north east of the peninsular. This is another resort, but is based on the small Sea of Azov, rather than the Black Sea like the resorts on the Southern and Western coasts. Whilst the resort had a number of long sandy beaches, Kazantip itself was a slightly hilly area jutting into the sea, with a network of small coves and beaches, ideal for those seeking their own private beach. The sea water was very warm here, and it was also an excellent area for exploring on our mountain bikes. Our final base was at a small town just to the North of the resort of Koktebel, on the South Eastern coast. From here we visited Koktebel itself, as well as the larger resort of Feodosiya. In Koktebel we went a dolphinarum, and watched a show there. I will now make a comparison between the Crimea, and another holiday area I know very well, Southern France. I have subdivided the report into various categories. France has a well developed network of fast railway lines that links many of its major cities, and these can zoom you great distances in a very short time. However it is not cheap to use, and also local transport links are far inferior, particularly in rural areas where a lack of buses means a car must be used to reach them. The Crimea has just one main line running through it, and the trains run very slowly. However local bus links are much better, and very cheap to use. Even where no bus service exists taxis will prove to be far cheaper than those in France, approximately a quarter of the price for the same distance. Southern France offers the full range of accommodation options, from expensive hotels, down to camping. There are also gites where you stay in a small house, or villas and houses that can be rented for a week. In the Crimea cheap accommodation is largely a matter of staying in the houses of local people, paying for each bed used. Typically guests are free to use the kitchen facilities, so it is not necessary to eat out all the time. At the top end there are hotels, which can be quite pricey, particularly in high season in the expensive resorts like Yalta. Whilst the standard of accommodation in France will be higher, prices will be much lower in the Crimea. A villa for 6 people will cost around 600 Euro for a week, whilst in the Crimea the price will be half, or sometimes even a third of that. France is well know throughout the world for its fine food, with the larger towns offering all types of cuisine, as well as French food. In the country restaurants are typically French, but of very high quality. Crimea offers mostly Russian and local varieties, although some, particularly Tatar restaurants, are very popular and offer many tasty dishes. The cost difference between restaurants in France and the Crimea is huge. A meal in a typical restaurant in France for four people, including wine, will cost around 120 Euro, whilst the same money could feed a group of 25 in the Crimea. Except for the Cote D’Azor area, most beaches in Southern France are of good quality with lots of fine sand, and reasonably safe bathing. Town beaches get very busy in the high season, but away from these are many long sandy beaches that are relatively quiet. Crimean beaches along the southern coast typically suffer from being quite stony, although there are some that are sandy. Along the northern coast however there are some long sandy beaches which are typically deserted. There are also many beaches set in small coves in front of cliffs, which offer private beaches to those that wish them. Both locations offer plenty of sights to see, and they are typically cheap to visit. Both offer plenty of beach activities like wind surfing, jets skiing and the like, although prices are likely to be more than double in France compared to the Crimea. Despite being a cheaper location for many other things, car rental in the Crimea is only slightly cheaper than that in Southern France, and outside the major dealers the renter has be careful that the rented car is fully insured. Bike rental is cheaper in the Crimea, but not by a major factor. Both locations offer entertainment like bars, and nightclubs, as well as things for the whole family, like fairs and shows. Prices in the Crimea will be typically half or less, with beer in bars in particular being a lot cheaper. Перевод с английского Анастасии Русановой. Автор отчета программист из Лондона Дэвид. Весь свой заработок от тратит уже не один десяток лет на путешествия. На юге Франции у него небольшой дом, поэтому район Лазурного берега он знает очень хорошо. По красотам ландшафта юг Франции несколько уступает Южному берегу Крыма. То есть, например, пейзажи Гурзуфа или Фороса значительно красивее. Наиболее близким по чертам ландшафта к Южной Франции являются окрестности Малореченского и вообще район между Алуштой и Судаком. При этом минусом этого района (как и Крыма вообще), естественно, является грязь, а плюсом простор и богатство дикой природы. Мы надеемся, что эта статья в ее оригинале и перевод будут очень полезны, прежде всего, коллегам Анастасии — студентам, от которых будет зависеть ближайшее будущее нашего туризма. Мы с другом отдыхали в Крыму по приглашению Игоря. Мы были в Крыму 3 недели и в течение этого времени посетили множество интересных мест на крымском полуострове. Мы путешествовали с частной визой, т. к. нас сопровождали местные жители; удобство такой визы состоит в том, что Вы не обязаны заранее указывать те места, которые собираетесь посетить. В мае 2005 г. украинские власти отменили визовый режим для граждан большинства стран Европы — такой режим был временно установлен до октября 2005 г., чтоб облегчить процедуру пересечения границы для гостей Евровидения в Киеве. Надеюсь, что этот режим продлят. зато он сносно говорит по немецки и по русски. и в конце концов денег за свой текст не запросил, так что чем богаты, тем и рады.